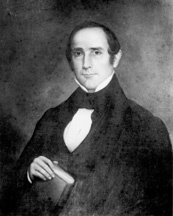 BIGGS, Asa, a Representative and a Senator from North Carolina; born in Williamston, Martin County, N.C., February 4, 1811; attended the common schools; pursued classical studies; studied law; admitted to the bar in 1831 and commenced practice in Williamston, N.C.; member of the State constitutional convention in 1835; member, State house of commons 1840-1842; member, State senate 1844-1845; elected as a Democrat to the Twenty-ninth Congress (March 4, 1845-March 3, 1847); unsuccessful candidate for reelection in 1846; member of a commission to codify the State laws in 1851; elected as a Democrat to the United States Senate and served from March 4, 1855, until May 5, 1858, when he resigned, having been appointed United States judge of the district of North Carolina by President James Buchanan; served as judge of the district court until 1861; member of the secession convention of North Carolina in 1861; Confederate judge 1861-1865; resumed the practice of law in Tarboro, Edgecombe County, N.C., in 1865; moved to Norfolk, Va., in 1869 and continued the practice of law until his death in that city on March 6, 1878; interment in Elmwood Cemetery. Dictionary of American Biography; Biggs, Asa. Autobiography of Asa Biggs, Including a Journal of a Trip from North Carolina to New York in 1832. Edited by Robert D. W. Connor. North Carolina Historical Commission Publications. Bulletin No. 19. Raleigh: Edwards and Broughton Printing Company, 1915.